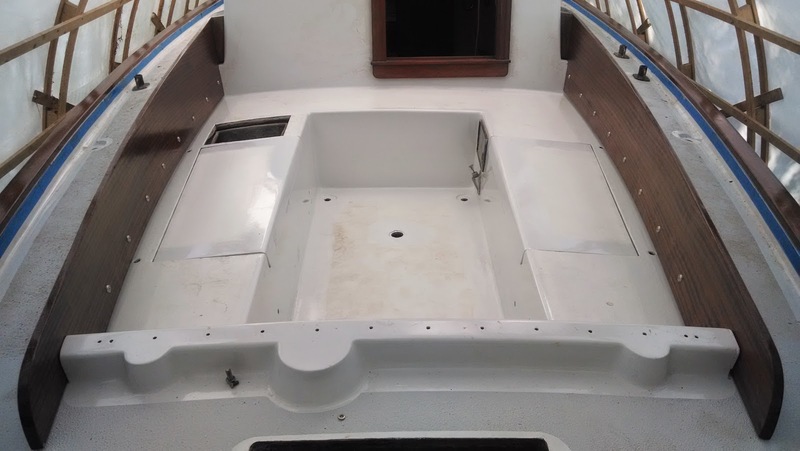 The good, the bad, and the ugly restoration of Magic, a 1962 Alberg 35 sloop (hull #16). After 6 coats of varnish in the shop on the outside of each coaming and 2 on the inside I decided it was time to get them installed for good. I figured that since I had already fitted them weeks earlier it would be a breeze to get them on again. Not so. A combination of errors on my part made the job very frustrating. I brought the coamings over from the shop and then opened up a new tube of SikaFlex 291 (mahogany) and laid several beads along the inside edge of the cockpit with one right at the top so that once I pushed the coamings in place, it would squeeze out a bit and provide a reasonably watertight seal. All that went according to plan but once I positioned the boards in place I decided that I would attempt to get the coaming block on the forward end bolted on first so there would be no gap between the cabin top side and the block. 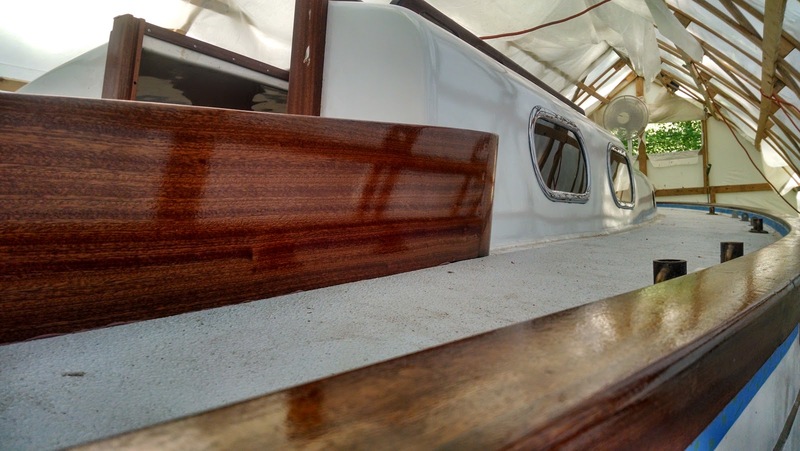 The 2.5" #14 wood screws that secure the coaming block to the cabin top sides are screwed in from inside the cabin. I didn't have a helper so I did the best I could to secure them in place, but I couldn't get the forward edge of the coaming to pull in to the cabin top sides. 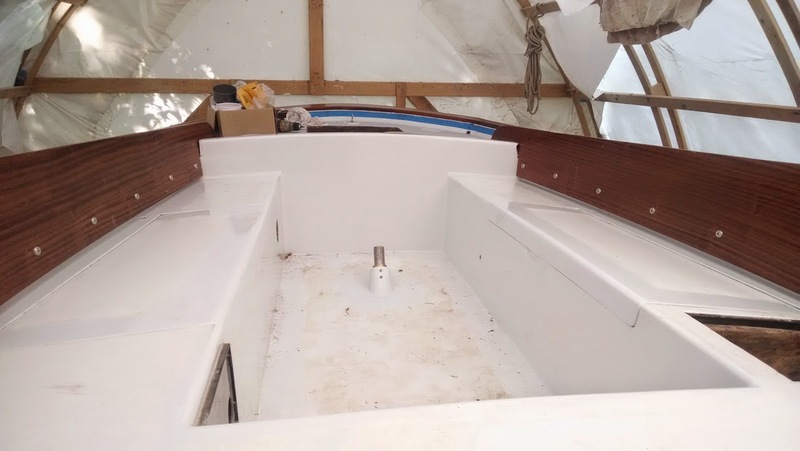 I eventually figured out that in order for them to sit flush, I needed to put the bend in the coaming board, which meant that I needed to bolt the entire thing down Before I screwed in the forward block. Grrr... So I unscrewed the three screws from each forward block and moved aft to get the coamings bent in. I eventually got everything done, but I was just generally annoyed at myself for working out of order and making the job infinitely more difficult than it needed to be. I will say though, that it looks really nice to have the coamings installed properly with shiny varnish. Looking yachty indeed, but I still need to get at least 6 more coats of varnish on the inside and 2 on the outside. Wow! Your Alberg 35 will surely turn heads!